Blogs > Technology > What is active learning and what are its keys to success? Active learning is about moving away from a passive approach to learning in order to start conversations and actively involve students in the learning process, but what does this mean for higher education and how can active learning be achieved? Active learning is a method of study that connects students with the subject matter and encourages dialogue. Rather than focusing on instruction and disseminating information, it is concerned with full engagement and immersing students in the educational experience. It uses collaborative techniques and visual communication which particularly appeal to today’s independent, technology-savvy learners. In experiments comparing traditional lectures and active learning, 12% fewer students failed exams, while the average grade saw a 6% rise on average. By keeping the educational groups small, and encouraging students to learn directly through discussion, rather than just sit and listen, you should see improving results. Rather than a lecturer teaching through presentations and handouts, and expecting the students’ attention to not wander, active learning can be thought of as a process where students help uncover information themselves and learn to understand it. It’s all about participation, collaboration and building a dialogue. In a connected world, where information is available everywhere and to everyone, learning has to be geared towards improving critical thinking skills, applying knowledge and motivating students to understand the underlying principles. With students spending an average of 26 hours every week on their phones and laptops, technology is central to the future success of higher education. This generation of students is accustomed to continually multitasking, and traditional, slower methods of communication are no longer relevant. Active learning has technology at its core, harnessed to conversation and engagement. For active learning to be a success, you need much more than just a linear presentation, video or mathematical proof. Above all, it needs to be engaging. Equally, the students must want to learn, they can’t just be satisfied with a simple explanation of the topic. As a result, active learning is well suited to higher education, where students have already made decisions about the value of the topics they are studying. Active learning isn’t all about abandoning the lecture format and heading down another path, the two work hand in hand. It can begin with asking students to review online or printed materials in advance of the learning session. The session itself is then dedicated to group work, dialogue and discussion, enabled by technology. Summarising concepts, comparing viewpoints and solving problems on a networked device are all opportunities that make active learning easier to introduce, manage and develop. With students owning on average five or more devices, technology is ubiquitous to them and they expect it to be an integral part of the learning process. In a world where knowledge is becoming commoditised, universities are facing the challenge of moving beyond information processing and into the realms of deeper learning. As Generation Z begins the journey into higher education, expecting a world of collaboration and visual communication, institutions need to cater for their needs or lose them to the competition. Successful active learning comes from a combination of dialogue, technology and setting. Universities have the opportunity to get creative, implementing two-way teaching strategies, such as flipping the learning structure around so students are introduced to materials before a class, so they have time to understand the basics, and adapting what already exists. 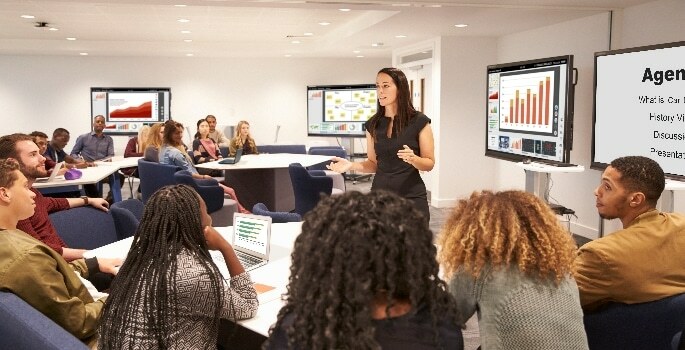 Interactive whiteboards, augmented reality, screen sharing technologies and BYOD initiatives are all tools that add to the collaborative experience, but that’s just the beginning. Combine these with the space to move, discuss and cooperate, both within the learning space and beyond, and active learning becomes a sustainable learning method that attracts students and connects with their needs. If you are moving towards an Active Learning approach and need a technology solution to support this, Sony can help.